Warm transfer eliminates this problem. Using Twilio powered warm transfers your agents will have the ability to dial in another agent in real-time. The first agent becomes available when he/she connects through the web client. The second agent also becomes available when he/she connects through the web client. While the first agent is on the phone with the client, he/she can dial a second agent into the call. Once the second agent is on the call, the first one can disconnect from it. This way the client and the second agent stay on the call. Let's get started! Clone the sample application from Github, and click the button below to begin. 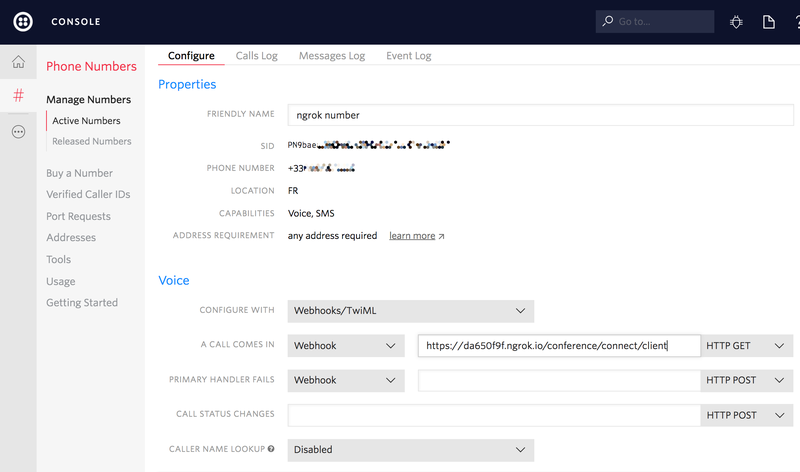 First let's configure the voice webhook for the Twilio number that customers will dial when they want to talk to a support agent. This should be the public-facing endpoint of your app in production. In the next step we'll take a closer look at capability token generation. In order to connect the Twilio Voice Web Client we need a capability token. To allow incoming connections through the web client an identifier must be provided when generating the token. For this tutorial we used fixed identifier strings like agent1 and agent2 but you can use any generated string for your call center clients. These identifiers will be used to create outbound calls to the specified agent using the Twilio REST API. Next up let's see how to handle incoming calls. When a client makes a call to our Twilio number the application receives a POST request asking for instructions. We'll use TwiML to instruct the client to join a conference room and the Twilio REST API client to start a call with the first agent, so he can join the same conference. We use the client's CallSid as the conference identifier. Since all participants need this identifier to join the conference we'll need to store it in a database so that we can grab it when we dial the second agent in later. Now let's see how to provide TwiML instructions to the client. Here we create a TwiMLResponse that will contain a Dial verb with a Conference noun that will instruct the client to join a specific conference room. Once the agent answers the call in the web client, a request is made to the callback URL instructing the agent's call to join the conference room where the client is already waiting. When the client and the first agent are both in the call we are ready to perform a warm transfer to a second agent. The first agent makes a request passing its identifier to allow us to look for the conferenceId needed to dial the second agent in. Since we already have a twilio-caller module we can simply use the call function to connect the second agent. Next up, we'll look at how to handle the first agent leaving the call. When the three participants have joined the same call, the first agent has served his purpose. Now he can drop the call, leaving agent two and the client having a pleasant conversation. It is important to notice the differences between the TwiML each one of the participants received when joining the call. Both, agent one and two, have startConferenceOnEnter set to true. This means the conference will start when any of them joins the call. For the client calling and for agent two, endConferenceOnExit is set to true. This causes the call to end when either of these two participants drop the call. And that's it! We have just implemented warm transfers using Node and Express. Now your clients won't get disconnected from support calls while they are being transferred. That's it! We have just implemented warm transfers using Node.js/Express. Now your clients won't get disconnect from support calls while they are been transferred to some else. Learn how to implement ETA Notifications using Node.js/Express and Twilio.